Owning a property is stressful enough without thinking about the building being hit by a natural disaster. As a landlord or property manager, there is a long list of things that you have to handle on a daily basis. The safety and security of your tenants is the top priority. Just as you are responsible for fixing everyday issues like broken pipes and clogged drains, routine maintenance is required to prevent dangerous situations from happening to renters and the property itself. Regardless of how prepared you are, accidents can happen. House fires are the most common cause of household accidents. According to the National Fire Protection Association, a house can expect to average a fire every 15 years. Is your rental property prepared for a fire? A fire escape plan for your apartment building is a number one priority. Begin by installing fire alarms, fire extinguishers, and smoke detectors. Each building should have well lit exits and sprinkler systems, but this isn’t enough to ensure that every resident is safe. On average, a renter only has about two minutes to escape a building if it is on fire. For renters that are on a higher level or those that cannot move as quickly as others, two minutes will pass by in a moment. Potentially leaving renters in harm’s way. When you create a fire escape plan and share it with your tenants, it gives them the best way to get out of the building and to safety as quickly as possible. Map out your building. Create fire escape maps in every unit. Residents should know all exit options in advance. Maps should also be posted in common areas like hallways and elevators. Every unit should have two ways out. These can be doors or windows, but two escape routes are mandatory. Lights that cut through the smoke. In the event of a fire, tenants can become disoriented. Having bright lights to guide the way through hallways to exits is incredibly helpful to keep everyone calm. Higher level escape plans. For tenants on the higher levels of the building, purchasing evacuation ladders for each bedroom is a great way to give tenants an extra escape route. The ladders are easily installed into the window frames and tenants climb down the ladders when fire strikes. Practice the evacuation process. Just like fire drills in schools, apartment fire drills should happen at least once a year. Cover any questions that tenants may have and walk through prevention tips to keep residents safe. 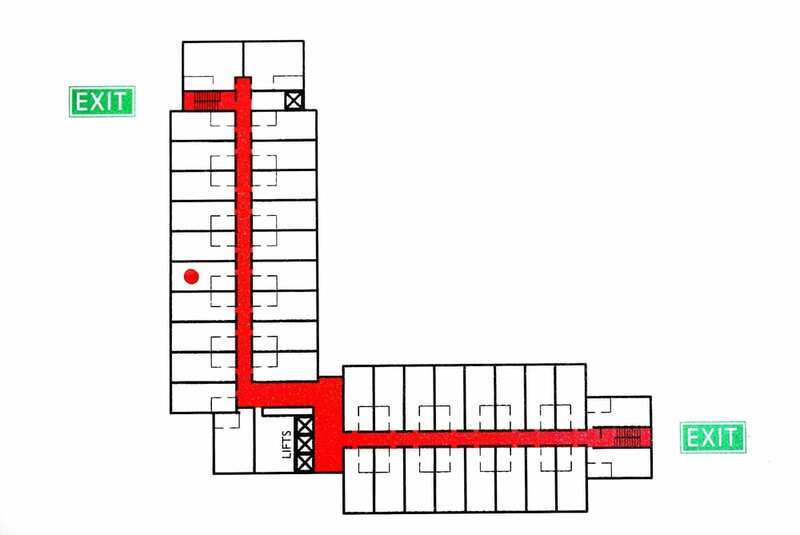 While every apartment building is unique in layout, planning a fire escape route follows the same basic steps. If fire strikes, A&J Property Restoration specializes in fire restoration services. We are always on call 24/7 for any emergency large or small and will assist with the repair of your apartment building step by step. Call today for more information or for our emergency response team immediately.